We dropped Skippy's bike to our new hotel (Big Apple D.E.) and left also some of my bike's luggage there (to prevent a total overload). 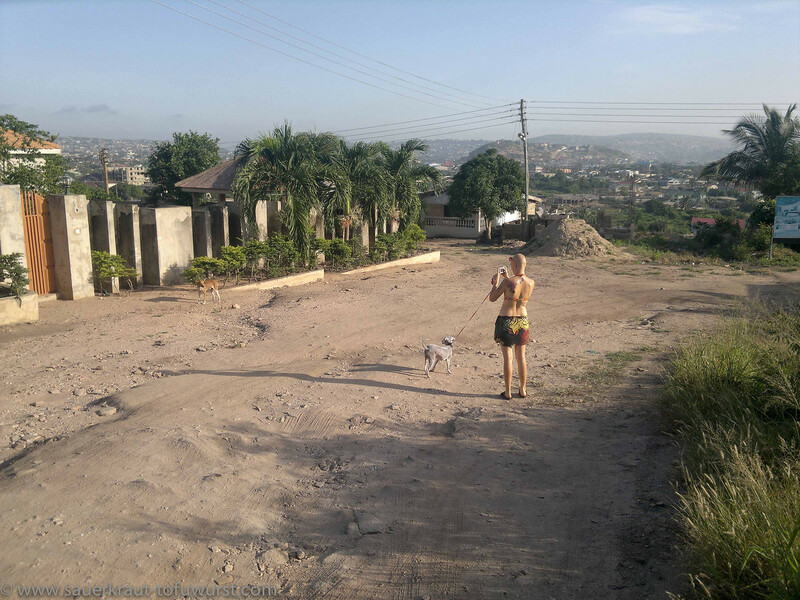 Then we rode together on my bike to Accra to go to the vet in order to check on Hertta. She was doing much better. Still a bit shaky on her legs but tail was waving. She got another antibiotic and a vitamin shot after which she was happy to go back into the safety of the sidecar. 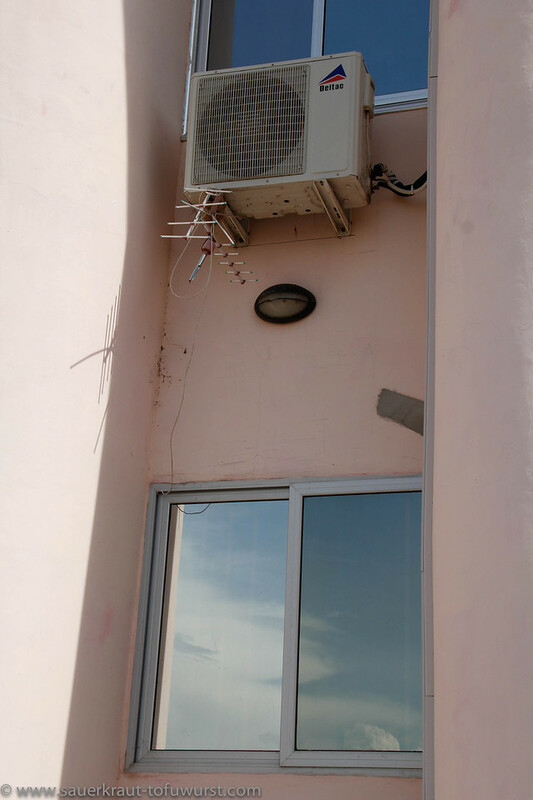 Antenna installation Ghana style - no wonder we had a poor tv-picture. The last segment of the street towards the hotel was a bit challenging. 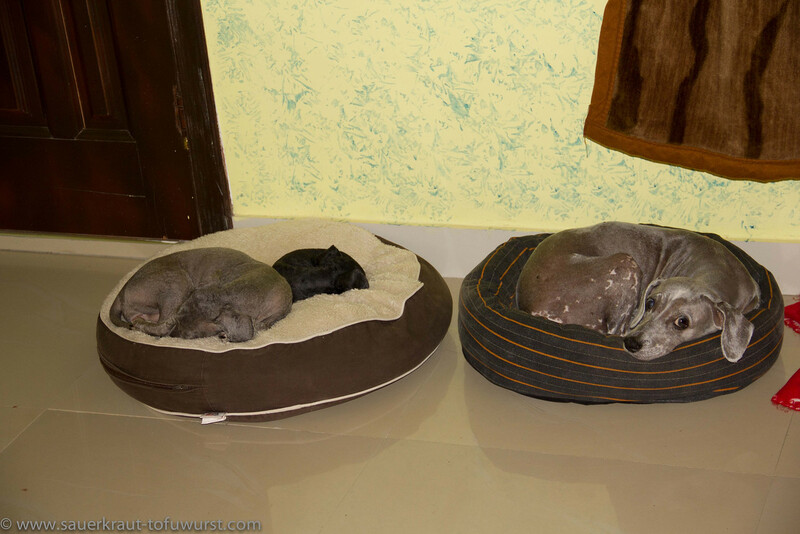 There was a short discussion about whether we can take the dogs inside the room (even though I thought I clarified that the previous evening during my reservation). Anyway, our heart breakers got all in and Hertta looked so sad, lost, half-in-trance that every human with a soul cannot help but pity her. We can only recommend this hotel. It is managed well and things are working there. The staff pays attention and is pro-active. Only with the Wifi we needed to ask them regularly because they used a Wifi/3G modem which ran out of credits frequently. We had been 7 weeks in Ghana and I would say that slowly but surely a great depression came over all of us and especially Skippy had only one thought: “OUT”! 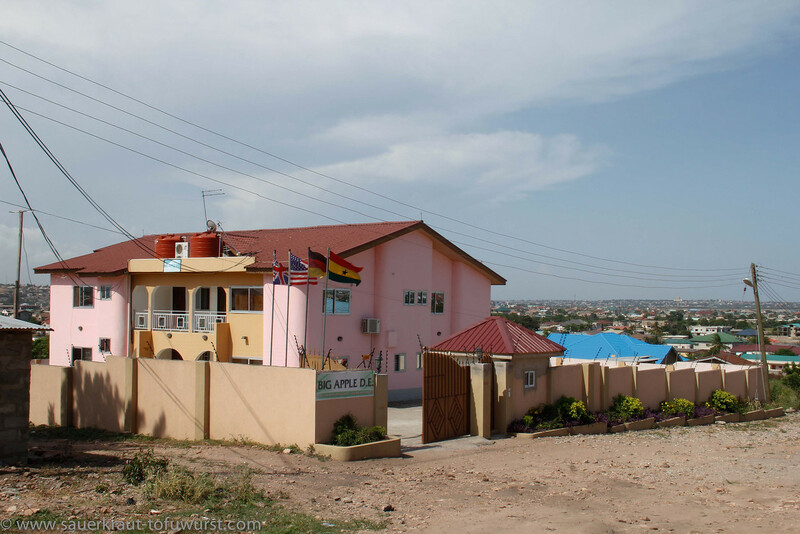 That was anyway a good idea because our visa were expiring soonish and strangely other rules would apply if one would stay longer than 2 months in Ghana (and if one would care about those rules) e.g. One needs to get a local driving license. I used the spare time to do the regular maintenance on my bike. Some small things needed fixing before they went totally broken like a fuel line. I also changed the left cam-shaft chain tightener to a newer model (let's see what happens to the rattling). Again plenty of time went to find motorcycle engine oil without success. 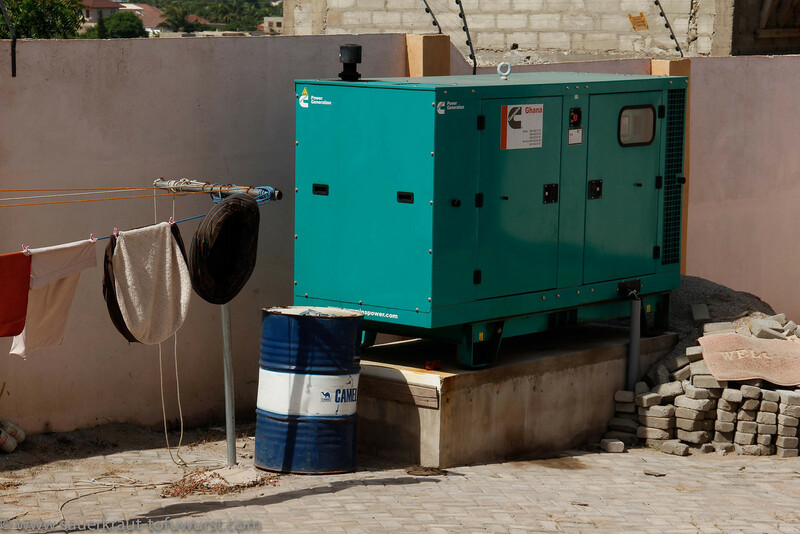 Ulpu started also to suffer from what we called Ghana-depression and needed some special attention. Once more to the vet and she got an IV as well as a few vitamin boosts. 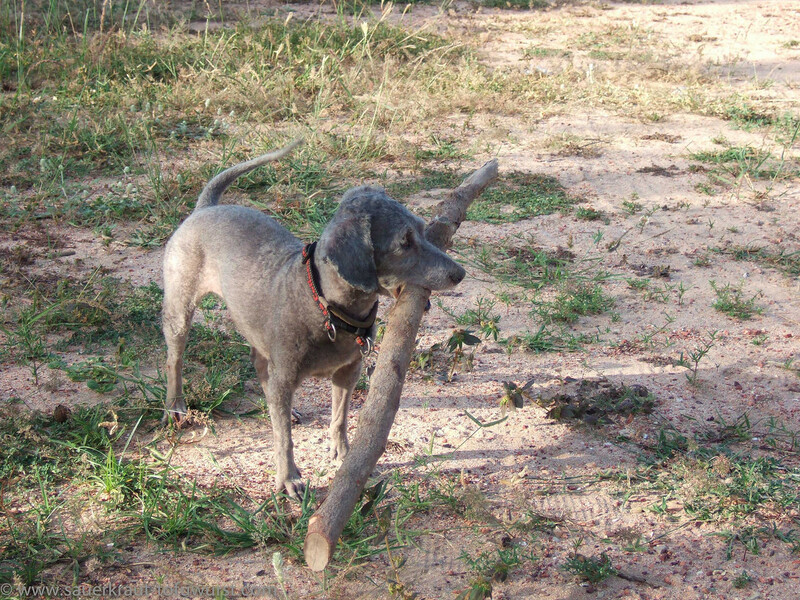 Skippy gave Ulpu some water since she did not drank enough. We got answers from four different shipping companies. Money and shipping time were the crucial aspects. 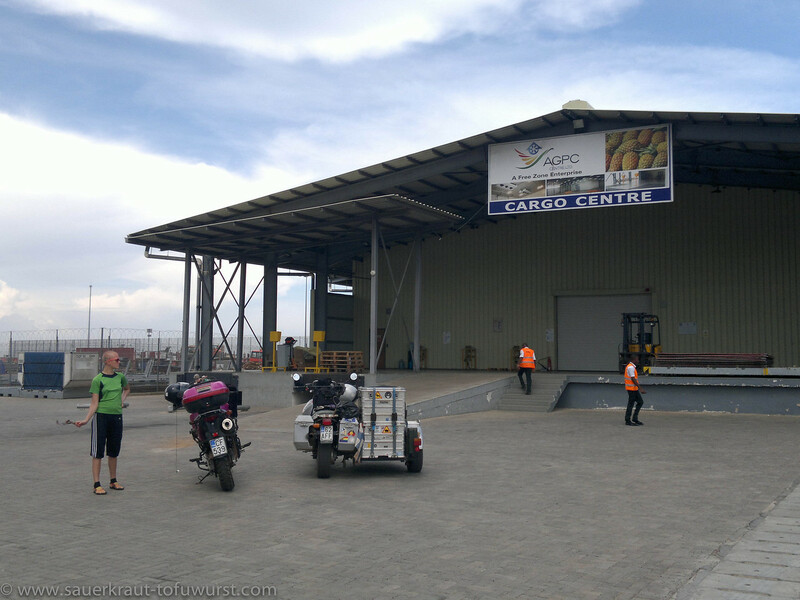 Air freight is more expensive and the bikes are transported within a few days whereas ocean-freight is cheaper and the bikes are at least 30 days in transit (plus waiting etc). The cheapest and most attractive had a total fare of about 3000 USD via ocean-freight. Overall that sounded great and it would be container shipping and no crates required. We pursued this option for quite a while before we changed our mind. This company was not getting into the real mood for taking concrete action. No local contact was given, total shipping costs were not told, many questions via email not answered. So we looked who is next. The other company which offered ocean-freight had enormously high costs on the destination side. 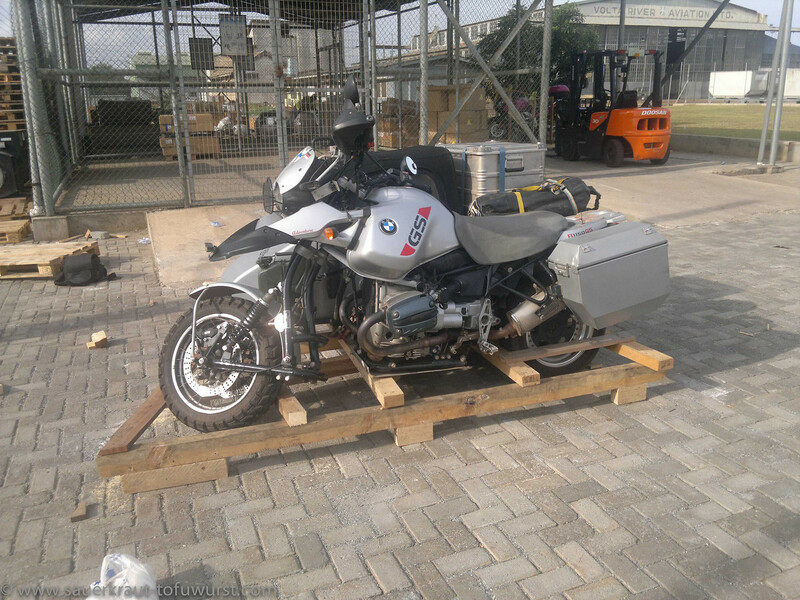 1300 USD alone for un-crating the bikes. Now after some math, it looked like that the air-freight with Turkish Airlines (Even though Delta flies in and out daily and our bikes are small enough to fit into the cargo bay, it appeared that Turkish Airlines flights via Istanbul are cheaper) and doing some project management by myself was cheaper then the ocean-freight from this other company. So we went ahead with that options and started to make arrangements. In the meantime we needed to arrange our flights. We wanted to take a direct flight from Accra to New York and Delta airline is the only one offering that. On our first phone call (pet travel must be reserved via the annoying Delta-airline service numbers in the US! ), they confirmed that we can take our little ones into the cabin and Hertta travels with us in the cargo hold. It was not possible to make a reservation without paying the tickets and so we decided to wait until we really knew what to do about the bikes. Skippy taking a picture of a stray dog. 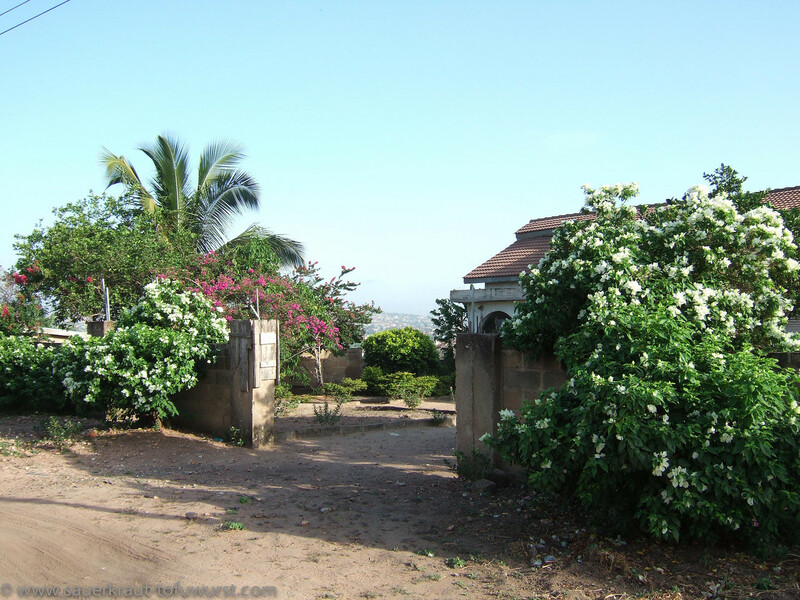 A few houses had lovely flowers. Typical picture - unfinished house occupied by temporary tenants. Now that the bikes seemed clear, it was time to make our flight bookings. I called Delta again and now the lady told me that Hertta cannot travel with us in the same flight but has to go on a different route with another airline and on a different schedule. WTF!!! No way! Here we were again and needed to start our search all over again. Lufthansa via Frankfurt? BA via London? We found out that Turkish Airlines has the cheapest flights and all dogs can travel with us. 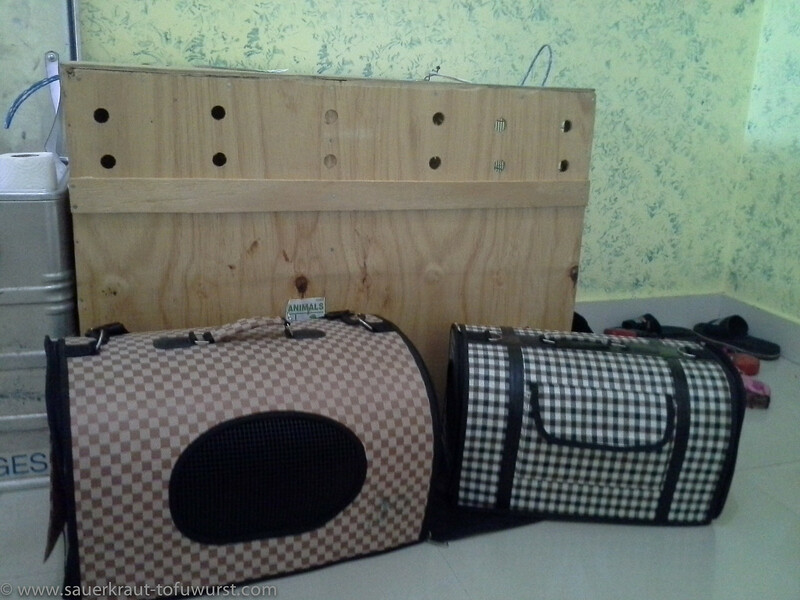 The little ones in the cabin and Hertta in the cargo hold. On Friday afternoon, we did the reservation at the airport (we could not pay our tickets there) and needed to wait for some ominous confirmation from somebody in Istanbul. It was Monday – no confirmation thus no tickets. Our first fresh jack fruit - unfortunately very raw and full of latex. 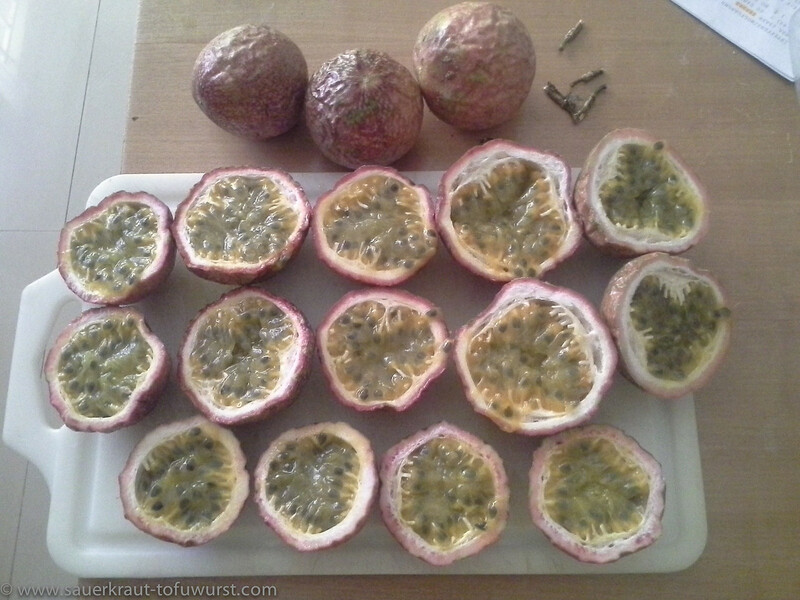 One day the shop had delicious passion fruits. In the meantime we continued progressing with the bikes. 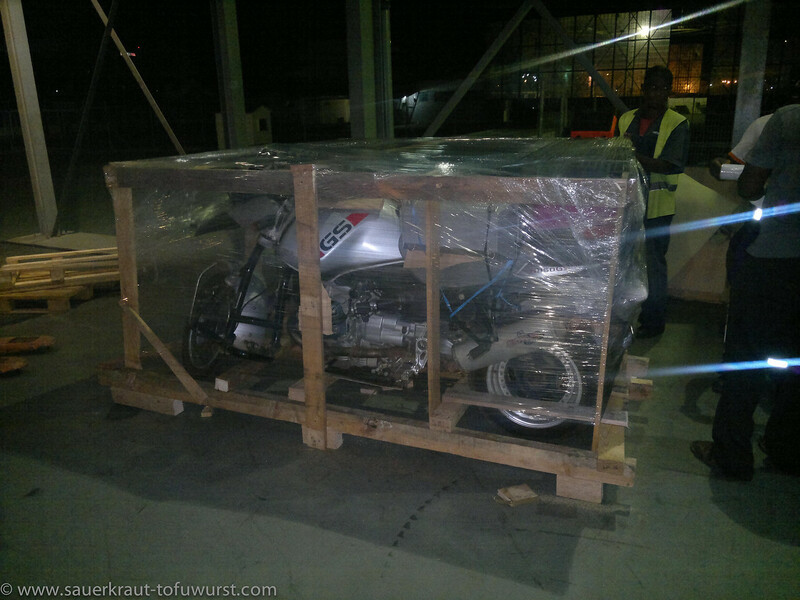 Importing a motorbike to the US is not that simple. We needed to have an approval from EPA, that we can drive our bikes in the US, before we can clear customs. There is also a need for DOT approval, and based on some info we would not have to pay any bonds neither customs duties. Besides this we need an insurance for the bikes to be allowed to drive around. At this point (we kept the original ocean-freight as a back-up and were also clarifying the offers from the other companies) the shipping companies made it really difficult and wanted to charge a LOT of money for filing those papers and even though it would not be required they also wanted to charge bonds and customs duties. 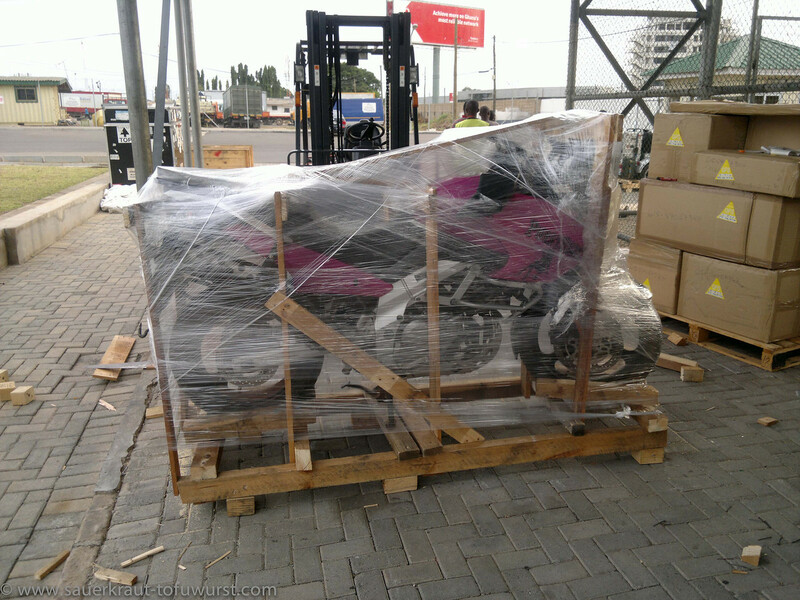 Due all those difficulties we considered for a moment to ship the bikes to Toronto, Canada and then go there to get them. Then I thought what-the-heck, I take care of clearing customs myself in the US! I got the bike insurance, filed the EPA papers, clarified with DOT that I only need to file a specific form as part of the customs clearing process and once more found official information that we should be free of customs duties and bonds. Things happen in Ghana the “Ghana-way”. First of all, tickets and all freight costs must be paid in cash – no credit cards accepted. Then I found out that my bank has a dummy menu on their webpage. They offer the service for Western-Union transfer online but then when I clicked it there came a window telling me “This service is no longer available online, please contact your closest branch”. F*** F*** F*** - and where do I now get all that money from? I became a “regular” at some of the ATMs in order to get the required amounts. Anyway I made it and the costs appear to be in the same range as with the Western-Union. 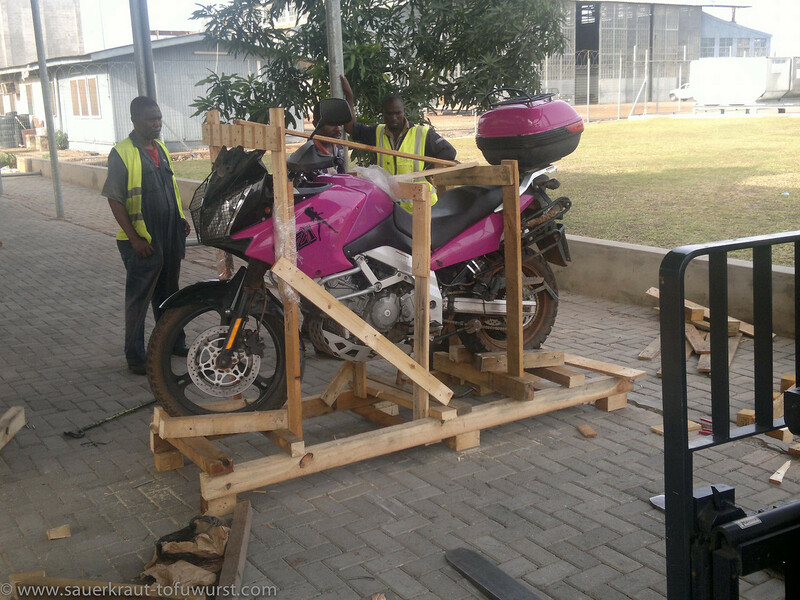 We drove the bikes to the local broker and the workers started to build the crate bottom. Four hours later we went back to the hotel with no bottom yet built for either of the bikes. They would properly start the next morning (which was May Day). We got our carnets stamped though after I did instruct the broker what to do and he instructed the customs officers (I really hope we get our deposits back one day). We arrived at the packing station. Lots of confusion on how to pack our bikes. 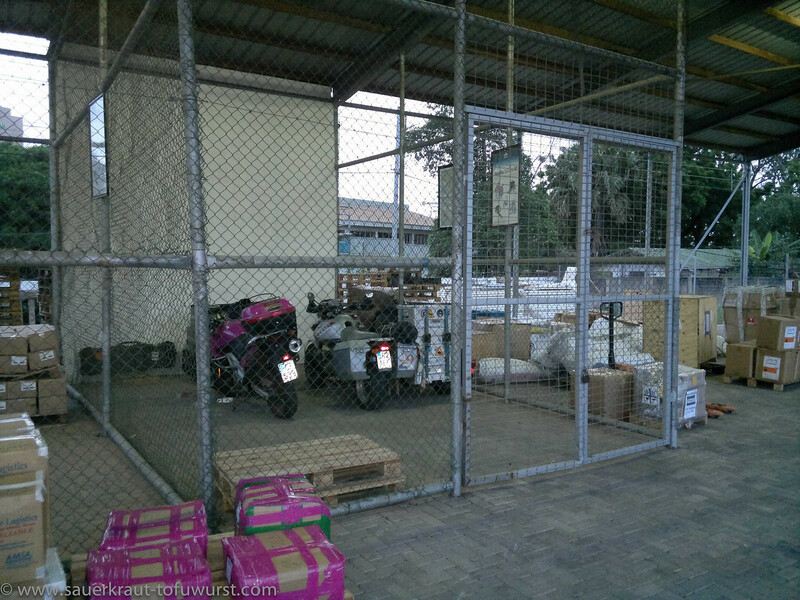 The guys gave up and the bikes went to a locked cage. It was 1st of May (Labour day) and the workers had indeed a hard day of labour in front of them. They built the entire bottom new for both bikes and it looked to me that they did this the first time which they did not (at least so they said). I let the pictures speak for themselves. And then came Narcotics security department. What a joke and a nightmare! They wanted to see into the fuel tank, under the seat and inside almost every box and case we had on the bike. They opened each and every case, put then the stuff just on the (dirty) floor and of course had no f***ing idea how to get everything back. A lots of yelling and shouting and I needed to pack all back. After the fourth case, I accepted my faith and let it come. Now I was waiting that they would see some of Milady's toys and her black belt. And this was the ONLY case they did not want to have opened. What a disappointment! :D Three hours later and we were done with this exercise. Then the workers continued to build the rest of the crate and wrapped the whole thing nicely into plastic. Narcotics were watching all the time! We got my bike weight in the last moment before they closed for the day and went to the office to make the air waybill ready. The gent who takes care of that reminded my agent in a cool and I-told-you-so manner that there needs to be a roof-plate of the bikes in order to put light weight items on-top of the bikes or else they would charge the entire palette which would be horribly expensive. Anger ... Frustration ... Ghana! The agent was so kind and gave me a ride back to the hotel. As soon as we hit the highway the traffic was standing on ALL lanes. One hour later we were still on the highway and the agent's car started to overheat and we pulled to a filling station to wait a little. I was back in the hotel around 22 o'clock, totally dead tired, almost too tired to eat and mentally exhausted. I got at least 20 mosquito bites on each leg as a souvenir. Second try - looks much sturdier to me. Suzi now packed in the same manner. Suzi wrapped after narcotics inspection gave green light. Finally (it's pitch black outside) SilberWolf is also packed. Next day the agent and the workers continued the construction of the roofs and I was just waiting there getting more and more nervous. The issue was that the bikes should leave on Saturday morning. I called the agent once in while and checked whether I should come to the airport or not or what and anyway to check what was going on. Finally it was a bit after 22 o'clock, I was already asleep, when the agent called and said that the bikes are ready for shipping. 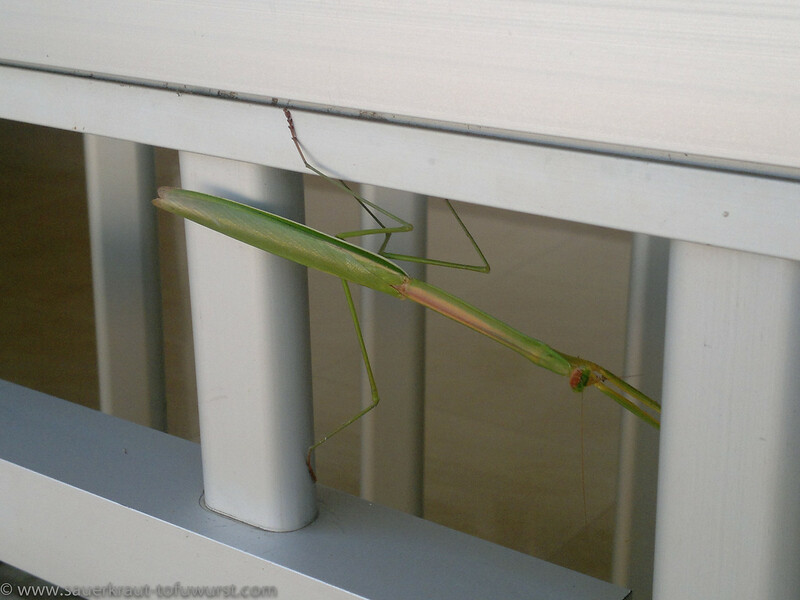 Saw this cool mantis at the hotel while waiting for the taxi. The dimensions had grown somewhat compared to the quoted cost calculations and I had not enough cash to pay my bill. So I went once more to the mall to plunder some ATMs and met the agent there. We went together to my hotel where I was then able to pay my bills. The bikes had already left the country in the early morning and were on their way to the U.S.A.
West-Africa was an adventure and I was a bit sad that our Africa journey ended here. 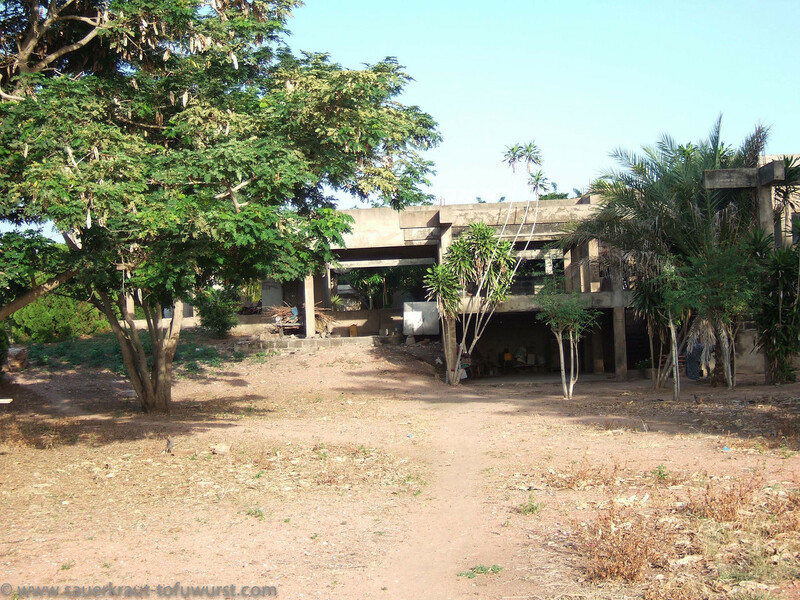 In fact everything in West-Africa was an adventure. Finding food, riding the roads, finding accommodation, walking in the streets and simple being and living life. All the countries we had been were dirty and trash was everywhere. People did not care for other people nor animals, neither nature. I was constantly regarded as an ATM and asked to give my bike and dogs away. Finding healthy food was often a challenge and (trusted) organic food is basically not known here. The heat and humidity was not really my thing. 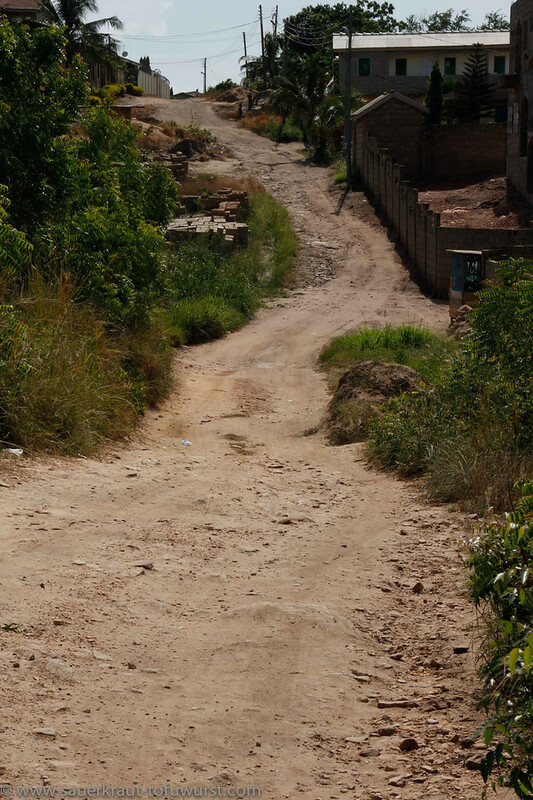 The roads we took were often boring with little to none feasible alternative routes. The traffic was hilarious and often dangerous. Go with the flow was a good method to ride. West Sahara offered the most solitude. Morocco had really beautiful nature spots, offered mountains, solitude, Sahara and gave a taste of Africa. It worked the best and was the most western country. If you want to visit West-Africa, I think it is sufficient to travel through Morocco and skip the rest. 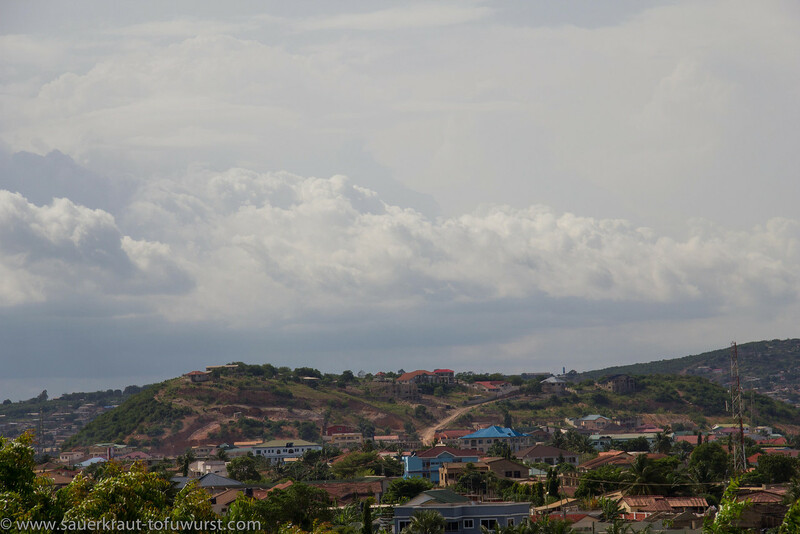 We felt that Ghana was the worst from those West-African countries which we visited. 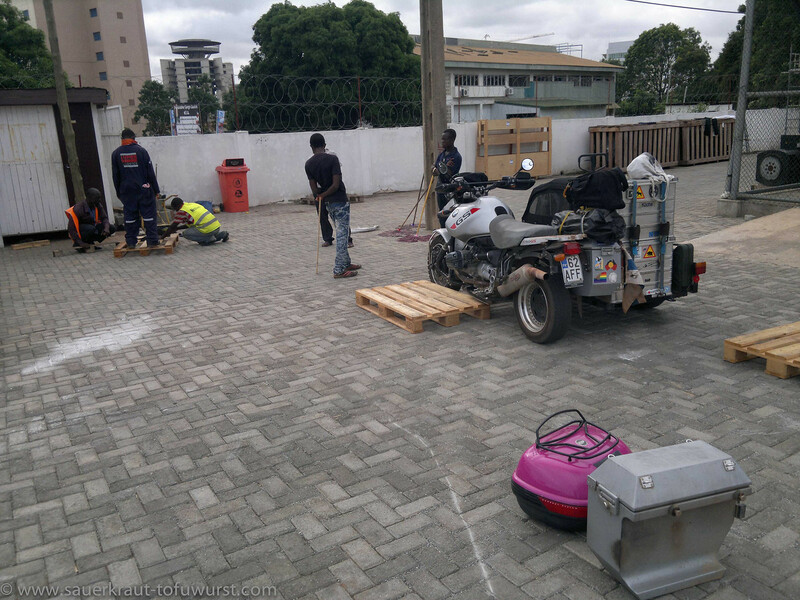 Nothing and I really mean NOTHING seemed to work, I was not able to find engine oil for motorbikes (even Burkina Faso was heaven compared to Ghana in this respect). I needed to get some papers printed (in the middle of our Accra stay) and the fourth official printing shop was finally able to print my documents. If you have trouble to watch this, please try this link.